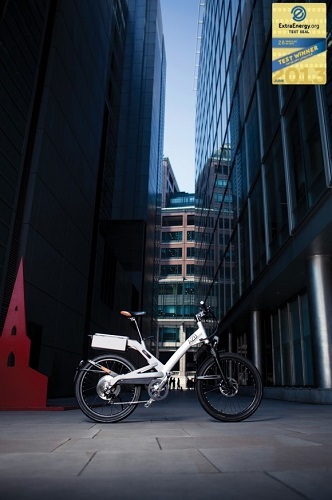 ExtraEnergy's 2013 testing of European electric bikes has seen A2B's Shima come out on top of the Lifestyle category, it was announced last week. This compact S-Pedelec weighs more than any of the other bikes on test – but it goes like a train. The A2B Shima is striking: exuberant design, technical flourishes, and huge fun to ride. But this compact S-Pedelec on 24” wheels weighs in at a full 32.3 kg. And yet it’s an eager performer, with the rear motor driving the Shima on gutsily. The powerful motor on the A2B Shima gives top assist levels, and along with the bold design this makes it the test winner in the Lifestyle category. 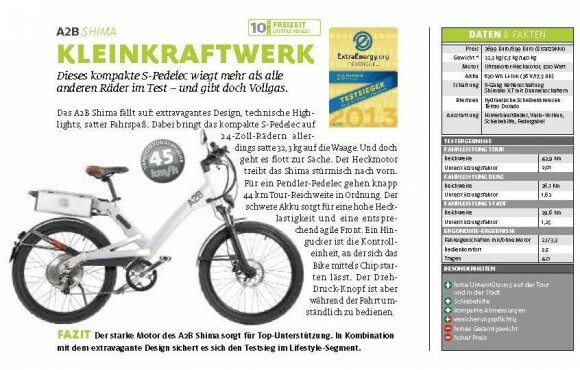 Extra Energy is hosting test ride experiences with the Shima and other award winning pedelecs at ISPO Bike 2013 held in Munich at the end of July. 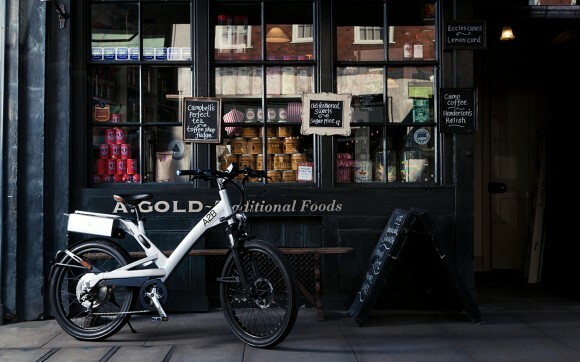 A2B will be present at the expo and a number of other exhibitions thorughout the rest of the year showcasing the newly extended A2B eBike range to both dealers and customers keen to experience the latest developments in the range. Visit the German Language and English Language event listing at the Extra Energy website for more details of the test ride event.